The Pacaya Samiria Amazon Lodge is located 74.5 miles (120 km) to the southwest of Iquitos, a 1.5-hour drive by bus or car. First you will reach Nauta, a small village on the outskirts of the reserve. From there, you’ll take a 2-hour speedboat ride down the Amazon to the reserve. On the way, keep your eyes peeled for pink dolphins, one of the Amazon River’s most distinctive inhabitants. Cabins at the lodge can comfortably fit from 4 to 6 people, with one private bathroom per cabin. 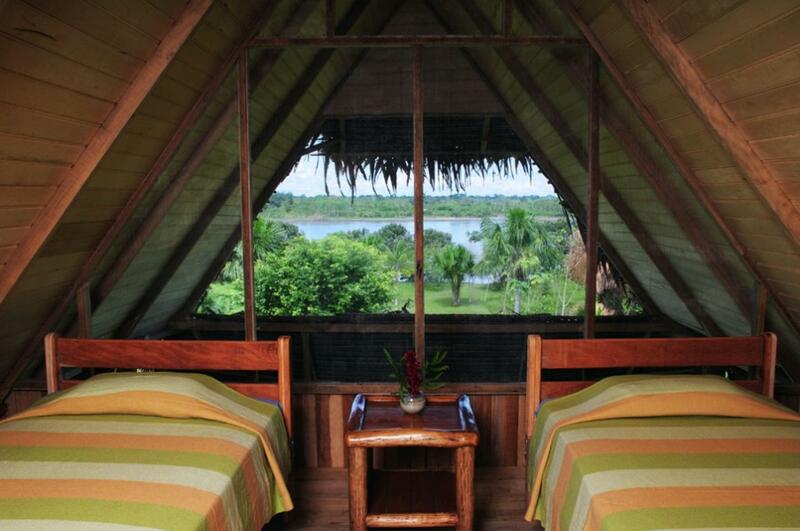 Each cabin comes with a layer of mosquito netting, so you can sleep without fear of the notorious Amazon pests. Cabins are built with sustainable materials and decorated with cheerful, colorful details. Most importantly, each rustic cabin has its own balcony, which offers guests an unimpeded view of the Maroñon stretch of the Amazon River below. At the lodge's club house, relax on one of the many hammocks or gather your fellow travelers to play a board game. Daily meals are provided by the lodge’s restaurant, which serves both traditional Peruvian and international cuisine. No matter what kind of schedule you keep while visiting the Amazon, you’ll have access to liquid refreshment at the lodge’s café, which serves coffee and tea 24 hours per day. The gift shop sells souvenirs alongside practical necessities for exploring the Amazon, such as ponchos and bug spray. On the grounds of the lodge, guests also have access to watchtowers — these are another spot to get a good eyeful of the intense, constantly evolving scenery of the rainforest. When you’re ready to explore the Amazon from the ground, the lodge provides maps of hiking trails in the area. Keep your eyes peeled for river turtles, sloths, birds, monkeys, manatees, and tapirs.